These are difficult times in Russia. The rouble is falling, inflation is rising, and capital is fleeing. There are fears of recession. But not everyone here is required to tighten their belt. Russia's new state news agency has just received a huge injection of cash. Rossiya Segodnya - which means Russia Today - was created by Vladimir Putin less than a year ago to promote Russia around the world. Its budget for next year is reportedly two-and-a-half times bigger than this year's - a sign of how important information is to the Kremlin. I telephoned Rossiya Segodnya to request an interview. When they put me on hold, I was astonished by the music pumped down the line. Now, what tune would you expect to hear, on hold to the news agency of an increasingly brash, self-confident Russia? The Russian army choir, perhaps? Or a lilting Russian folk melody, like Kalinka? Well, it was neither of those. 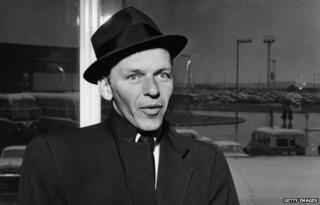 It was Frank Sinatra singing Anything Goes. I sat there listening to Old Blue Eyes. And suddenly it dawned on me: this song encapsulates today's Russia. Because this is a country now where "anything goes". If someone had told me a year ago that Russia would annex the Crimea, I wouldn't have believed them. Even President Putin himself had told the world he wouldn't do that. But he did. After all, these days "anything goes". Few people expected Moscow to arm, to encourage and to bankroll separatist rebels in eastern Ukraine, let alone send its own soldiers across the border to fight alongside them. But it did just that. Once again, it seems that anything goes. And when "anything goes", well, the most bizarre things start to happen. The other day I witnessed a group of Muscovites on the street taking off their T-shirts - all the tops had western signs and symbols on them. And what did they do with the removed items? They swapped them for Russian t-shirts that some activists were handing out. A sort of patriotic "top swap". The brand new, more politically correct clothes bore images of intercontinental ballistic missiles, and catchy slogans like "This rocket isn't scared of sanctions." But, in a country where "anything goes" reporting becomes more difficult. This month something happened to our news team which I'd never experienced before in my 13 years covering Russia for the BBC. We'd travelled to a village near Astrakhan on the Caspian Sea to interview Oksana, whose brother Konstantin was a Russian soldier. This summer he'd told his sister he was being deployed to Ukraine. Three weeks later he was dead. The question of Russia's military presence in eastern Ukraine is a sensitive one: Moscow continues to insist it hasn't sent a single soldier across the border to fight. On leaving the village we were stopped briefly by the police. They wanted to know who we were. Then we drove on to Astrakhan, parked the car and went to have lunch. Later, when we were walking back to the vehicle, three men ran up and attacked us. They hit our cameraman, grabbed the camera, smashed it on the road and sped away in a getaway car. That evening our crew and our local driver were summoned to the police station. The police took away our mobile phones. We'd get them back soon, they said, once we'd given our statements. But the questioning seemed to take forever - we were there for more than four hours. When we finally got back to the car, it was clear that - in our absence - someone had been inside. All our bags and cases had been repacked and beautifully stacked. And copies of Oksana's interview had been destroyed. All that effort to stop us getting the story out - and all in vain. Because we'd fed the material to London during lunch. Over the next few days, all kinds of imaginative articles appeared on the Russian language internet about what had happened to us in Astrakhan - more fairy tale, than fact. Some authors accused the BBC crew of having been drunk and of starting the fight. Others asserted the whole sad story never happened - our claims were just a "provocation". One author likened western journalists to a "pack of jackals" trying to attack the "unyielding Russian lion". In other words we were the criminals, and not the victims. Perhaps I shouldn't be too surprised. In Russia, increasingly, events are turned upside down, back to front, inside out, until they bear little resemblance to what actually happened. And that is another reason why Anything Goes seems a suitable anthem for modern Russia. In the words of Mr Sinatra: "The world has gone mad today. And good is bad today. And black is white today. And day is night today."